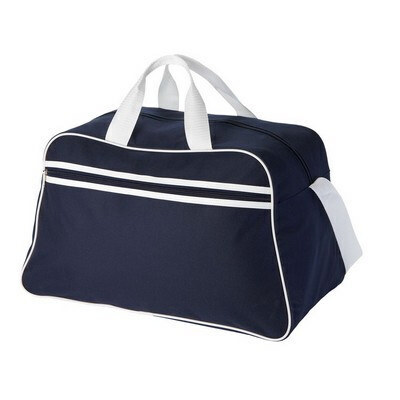 Description: This retro style sport bag is made from 600D polyester material and features a zippered main compartment and front pocket with zipper closure. Available in 2 colours. Features: No business card holder featured. Packaging: Polybag. Colour: Black & White. Material: 600D Polyester. Product Size: 485mm(w) x 280mm(h) x 257mm(d) Freight details : 40 per carton, 18kgs, 34 x 45 x 50cms; Decoration Type(s): Colour Print / Embroider / Full Colour Print Decoration Area: Screen: 230mm(w) x 120mm(h). Embroidery: Centred on front pocket: 150mm Dia. Other Methods: Contact your decorator for applicability and size.